Ask around the world and you’ll hear that everything is bigger in the United States. Perhaps that explains why there are at least 195 roadside attractions in the US that consider themselves the “world’s largest.” They aren’t all verified—some are outright wrong. But each makes its claim with the gusto of a carnival barker, another trait that could be considered very American. Across 41 states, here is the World’s Largest Map of the World’s Largest Roadside Attractions. Or is it? At first glance, you’ll see these attractions are well distributed across the country. Sure, they get a little sparse in the open fields of the west, but everything does. There are six states that have more than 10 of these attractions, with California and Ohio leading the way. The Golden State tops out 48 other states with more than a dozen “World’s Greatest” to explore. 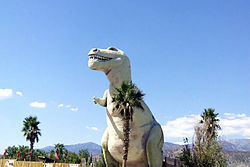 Perhaps best known are the dinosaur statues of Cabazon, California. These creatures off the I-10 were featured in the 1985 film Pee Wee’s Big Adventure. The Brontoosaurus and Tyrannosaurus rex weigh a combined 250 tons. Other California attractions include a thermometer, an artichoke, and the famous donut at Randy’s Donuts in Inglewood. Midwest stalwart Ohio hangs with the coastal elites when it comes to roadside attractions. The Buckeye State is tied with California, though perhaps not with the acclaim of some of the west coast locations. Still, the list includes a crystal ball, a cuckoo clock, a cheese wheel and — not just a pumpkin, but also a pumpkin pie. Each one claiming to be the world’s largest. 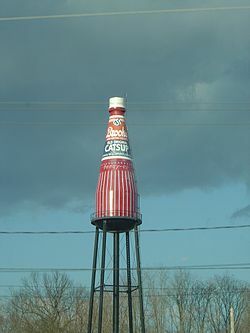 If you find yourself driving through Illinois toward St Louis, you really owe yourself a stop at the World’s Largest Ketchup Bottle. You can’t miss the big red water tower with a white cap and an old timey looking “CATSUP” spelled across a green label. The Ketchup (or Catsup) Bottle is joined by 10 other world’s largest people, places, and things. They include the largest statue of the state’s native son, Abraham Lincoln, a wind chime, and rocking chair. Notably, seven of the 11 are located in the city of Casey, by far more than any other single city. From a crucifix to a lugnut, Michigan has you covered. The state’s two cherry pie champions are detailed in the disputed records below, but there’s still fun to be seen without desserts. For example: Ishpeming, Michigan, is home to both the World’s Largest Running Chain Saw and the World’s Largest Working Rifle. That sounds like the World’s Largest Liability. The land of lakes pays homage to, among other things, its state bird. The World’s Largest Loon in Vergas welcomes visitors each August for Looney Dayz. Of course, you can find it any time of year, sitting near highways 4 and 228, standing nearly 20 feet tall. 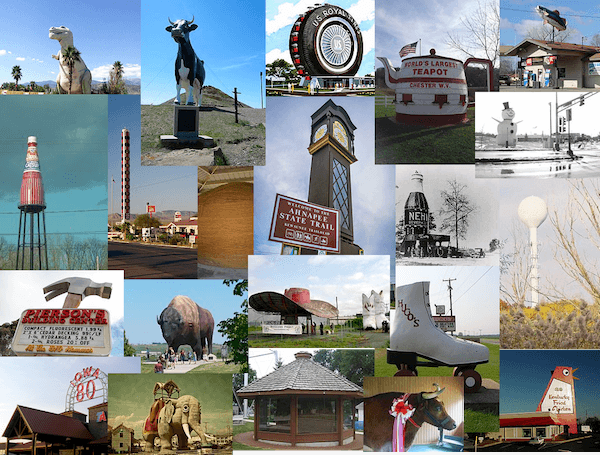 Seven of the 11 Minnesota roadside attractions are animals. In addition to the loon, there’s a Fish, Prairie Chicken, Pelican, Turkey, Tiger Muskie, and Walleye. Not to mention that ball of twine. Finally, the biggest state in the contiguous United States weighs in at 11 world’s largest roadside attractions. And this Texas list is so folksy, we just can’t help but share the whole darn thing: World’s Largest Caterpillar, Fire Hydrant, Jackrabbit, Muleshoe, Pecan, Rattlesnake, Roadrunner, Watermelon, Patio Chair, Peanut, and Strawberry. Most of these are outside the state’s largest cities. But if you find yourself in Dallas, you might as well go check out that patio chair. It comfortably seats two. The veracity of the claim “world’s largest” is not always respected. Indeed, there are many duplicate and disputed examples on the map. In fact, the Wikipedia article from which we created this map is under review, as editors has out which are the real world’s largest. In the meantime, these roadside attractions are likely delighting those who see them. Does it really matter which cherry pie is largest? Can you believe it? Three world’s largest strawberries. I think the others should concede it to a city with “strawberry” in the name. Orlando gladly gives World’s Largest McDonald’s to Vinita, Oklahoma. That’s because the Florida city proudly claims the second-largest location of the popular fast food restaurant. Oh, and that cherry pie? It matters to some folks in two Michigan towns. When the record was set in 1976 by the town of Charlevoix, Michigan. At 17,420 pounds, you’d think nobody would try to break it. After all, the Charlevoix pie was made with cement mixers, dump trucks, and required a helicopter to sprinkle the sugar on top. Yet, just 11 years later, Traverse City, Michigan, just 50 miles away, eclipsed the record with its own 28,000 pound pie. This article traces the history of that rivalry, though both have since been beat by a city in British Columbia. Some claims are so specific or unwanted, that they deserve every commendation. The Berkeley Pit in Montana is a former copper mine that is now the Worlds Largest Man Made Body of Toxic Water. You can have that one, Montana. While Minnesota does not have the World’s Largest Ball of Twine, it does have the largest one created by one man, which makes it notable. Cawker City can keep their record, as the entire community continues to add twine. World’s Largest Collection of World’s Smallest Versions of World’s Largest is also the longest name of any on the map. And finally, the World’s Largest Squirting Clam in Long Beach, Washington, doesn’t really need the “squirting” qualifier. Though sometimes called a Spitting Clam, there appears to be nobody else claiming the World’s Largest Non-Squirting Clam. Explore more of our World’s Largest Roadside Attractions Map in a full window. See what unique and wonderful things you can find. And when you’re ready to add your own strange locations to a map, check out our super simple map building tool.